The Institute grew out of the Palit Research Laboratory in Physics of the University of Calcutta (CU). Professor M N Saha came back from Allahabad in 1938 to succeed Sir C V Raman in the Palit Chair of Physics. In the discovery of Nuclear Fission by Otto Hahn and Fritz Strassman in 1939, he had seen immense potential of nuclear science for betterment of the country. By 1940 he had had the syllabus of the Post-Graduate Physics reorganised to include Nuclear Physics in the Physics curriculum. Multifarious experiments in Nuclear Physics and instrumentation had started in his laboratory. Soon a small-scale cyclotron was felt necessary for gaining a first-hand knowledge in this virgin field. He decided to have it built here rather than buying one.Thanks to Jawaharlal Nehru's help and Dorabji Tata's generosity, fund was soon available for procurement of parts of the machine. Courtesy to the University a piece of land became available within the University College of Science campus in Rajabazar at 92 Upper Circular Road (now known as Acharya Prafulla Chandra Road) for erecting a building to house the machine. In fact, the laboratory was already too small to contain the spate of activity. 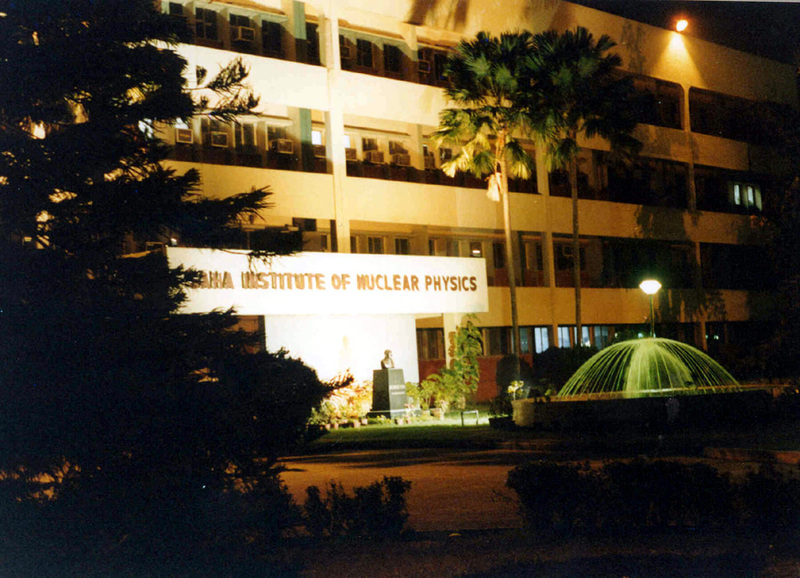 Soon after laying of the Foundation Stone for the building by Dr Syamaprasad Mookerjee the Institute of Nuclear Physics was founded. The year is 1949. 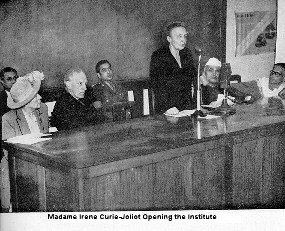 When the building was formally inaugurated by Madame Irene Joliot-Curie on 11 January 1950, a date now accepted as the Foundation Day, the Institute was fully functional. Foundation stone for a students' Hall, on a piece of land just behind the campus was laid by K D Malavya in early January, 1956. A few days later, on 16th February Professor Saha passed away. Some time after this the Institute was renamed as Saha Institute of Nuclear Physics. The Biophysics group in the Palit Laboratory had moved in the new building as soon as it was complete. It soon became a Division and called for a separate building to which it moved out in 1964. It was located in the northern part of the city of Kolkata called Belgachia. The Institute shifted to its new building in Bidhannagar in the late eighties. 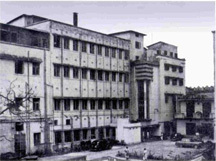 The Biophysics Division also shifted completely to the Bidhannagar campus after 2000. Basic research is carried out in frontline areas of Physical, Electronic and Biophysical sciences. Such activity is coordinated by various research divisions in the institute. The institute also has various teaching and training programs. Initially a part of the University of Calcutta, the Institute was accorded autonomy in 1951. Since then a Governing Body (Council from 1972), chaired by the Vice-Chancellor of the University of Calcutta and having representatives from the University of Calcutta, the Union Government and the Government of West Bengal, was in the management until 1992 when this tripartite agreement came to an end. The Institute entered a contract with the Department of Atomic Energy, Government of India by which SINP retains its autonomy with the administrative control now passing on to the DAE. It has the recognition of the University of Calcutta as a Centre for conducting research for doctoral degrees and providing facilities for teaching and research in Physical and Biological Sciences. The Chairman of the Atomic Energy Commission, India (and Secretary, DAE, Govt of India) chairs the governing council with members comprising three scientists nominated by the DAE, two representatives of the DAE, two nominees of CU, one nominee of Govt. of West Bengal and the Director of the Institute.